Want to quickly see how the open-source software OpenCart works? You'll find a free and updated demo installation of OpenCart here. OpenCart CMS is a free, open source online management system built using PHP, HTML components and a MySQL database. Its creator was Christopher G. Mann who started working on the project back in 1998. It was initially developed in Perl and its first release was in May 1999. However, in 2000 all progress stopped and five years later the domain name expired. Daniel Kerr saw it as the perfect opportunity to use it as a cornerstone for his own e-commerce software, written in PHP. He released the first stable version in February 2009. OpenCart CMS quickly started gaining popularity and in April 2015 it was recorded as responsible for 6.42% of the global e-commerce volumes. What this actually means is that it managed to surpass other popular ecommerce softwares such as ZenCart and Shopify. In 2017 Daniel Kerr announced that there are over 317.000 website who are using opencart as a shop CMS, managing to also surpass Magento. To get a more comprehensive OpenCart review you can use the links above and try OpenCart online. Use the backend site login to get a sense of the admin demo and all the features it offers. The screenshots below gives you a preview of how an OpenCart admin panel looks like. The admin dashboard has a mobile responsive page template, allowing you to manage your daily business activities from any device, even if you are on the move. When you login to the OpenCart CMS demo, you’ll get an overview of the most important things like total orders, sales, customers or people who are online, browsing the website. The design of the admin panel makes the software very easy to use. If you want to set up your own OpenCart shop demo all you have to do is download the software for free and install it. However, there are certain requirements that need to be met in order for your OpenCart demo site to function properly. You’ll need hosting and a web server, preferably Apache, with PHP 5.4 or a higher version and a MySQL database. If you need help with the installation process you can search for a demo installation tutorial and check with your hosting providers that all required PHP libraries and modules are enabled. After uploading the files to your server using FTP, all you have to do is run the automatic installer and it will install automatically. When this is completed you can start configuring your OpenCart shop demo by adding content and products. You can also change the design of your online demo by choosing one of the OpenCart themes available, or download and install a theme developed by someone else. 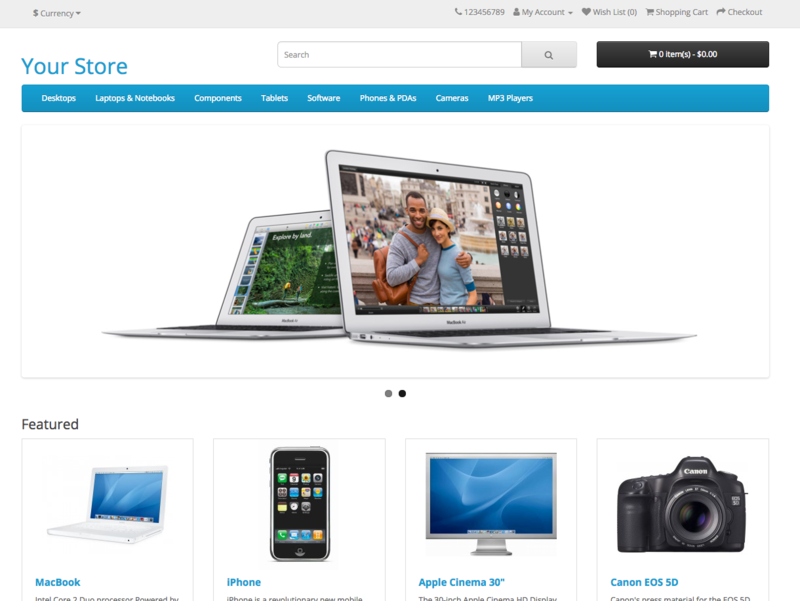 The OpenCart demo website we’ve set up uses a demo theme to display the products in the frontend. Aside from design customization, other OpenCart features include the ability to set access levels and privileges for your users or managing more than one stores from a single admin interface. You can also customize your products by adding different options and attributes depending on your needs. If you want to extend the functionality of your OpenCart shop demo there are a lot of plugins you can install from the Marketplace. The OpenCart Extension Store offers many plugins, modules, extensions or OpenCart themes, some of which are free. OpenCart is responsive by design, so your online shop will look good on any size screen. There are many OpenCart examples that use this ecommerce software not only to manage their online shop, but also as a content management system. Because it offers support for multiple languages and currencies and the ability to add your own language pack, you can find successful OpenCart examples all over the world, regardless of their business size or industry. OpenCart uses an MVC (Model-View-Controller) architecture that was extended to include a language entity, turning it into MVC-L (Model-View-Controller-Language framework). It also offers an API, which allows for easy integration with third party applications. The latest OpenCart version available for download is 3.0.2.0 and was released on July 18, 2017 under the GNU General Public License. In order to download it you can use the link below to go the official OpenCart download page.